Being a small business owner myself, I understand the value of a dollar and how important yours are to you! I have a variety of ways to help create those amazing memories and captured moments while saving some money in the process! Check the programs out below, and please do not hesitate to email me with any questions! You have friends, coworkers, family, acquaintances, etc. How about earn money by referring them to Moments by Heather Edmunds Photography for their photo needs! They will have an amazing custom experience and YOU earn $25 off for every referral you send that books. Rewards are stackable, refer 4 friends, that's $100 off a custom session of your own! Submit a referral below and start earning! 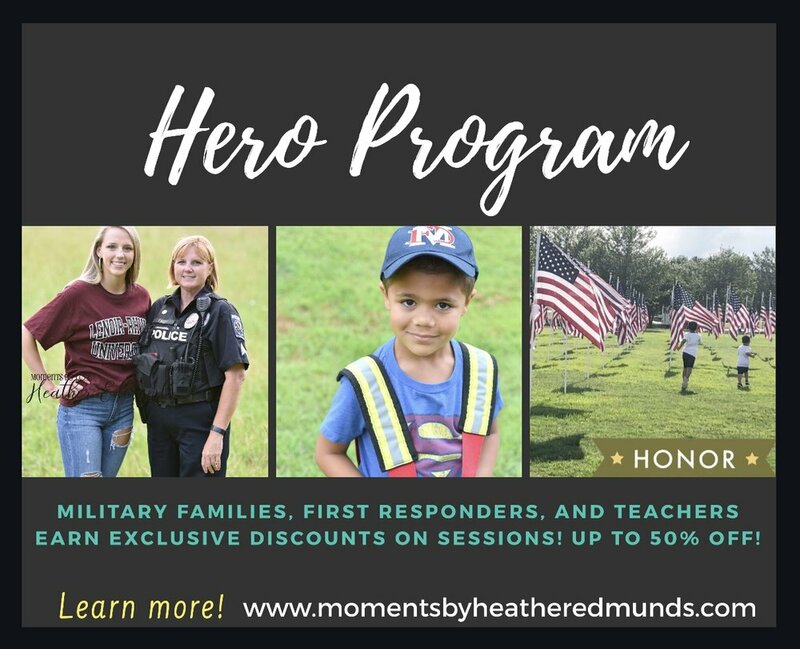 As a THANK YOU to all the men and women that serve in our military, protect our communities, and teach our children I offer a HERO discount that saves up to 50% off regular session rates! Discount is valid for members of the military, Law Enforcement Officers, Firefighters, EMS Responders, and Teachers. Want to start saving? Tell me about yourself below and I will be happy to help put a package together for you! Would you like to earn money towards your photo sessions? Throughout the year I will have various sessions, projects, or events where I need an assistant. I also always give money towards sessions for those who help with marketing my business. Are you interested? Fill out the form below and tell me how you would like to help! Are you a frequent client of Moments by Heather Edmunds Photography? Did you know that once you book your second session you start to save, and after your third session you become enrolled in the VIP program! Being a VIP member means exclusive discounts and savings on your session rates year round! Want to find out if you're a VIP? Contact me below! I LOVE birthdays and what better way to celebrate than a special gift on yours! Fill out the form below with your birthday and on your birthday be sure to check your email! *Only 1 birthday reward per family please.